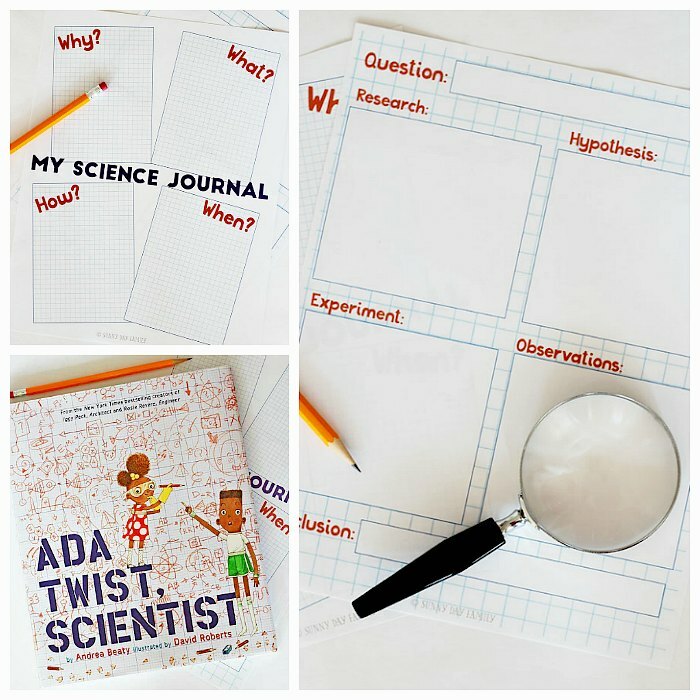 A free printable science journal for kids inspired by Ada Twist, Scientist! "Mommy, why is there a sky?" If I had a nickel for every question I was asked in a day I'd be a rich woman. If I had the all the answers I'd be even richer. 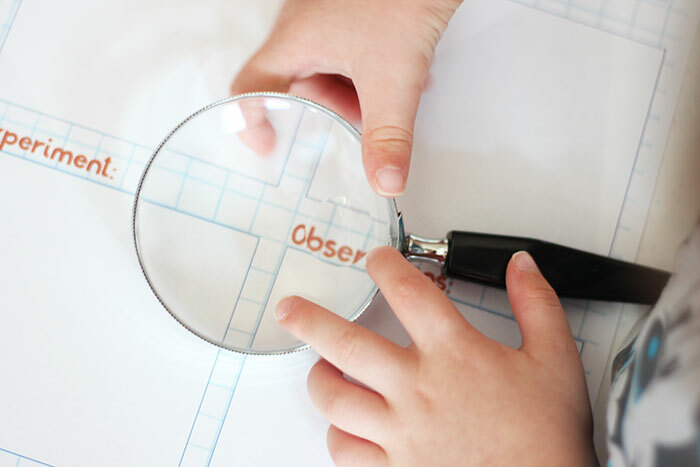 Kids are naturally inquisitive and love to ask questions about their world. And even though I don't have all the answers, I know how to help find them. I want to encourage my kids' curiosity about the world and what better way to do it than with science. 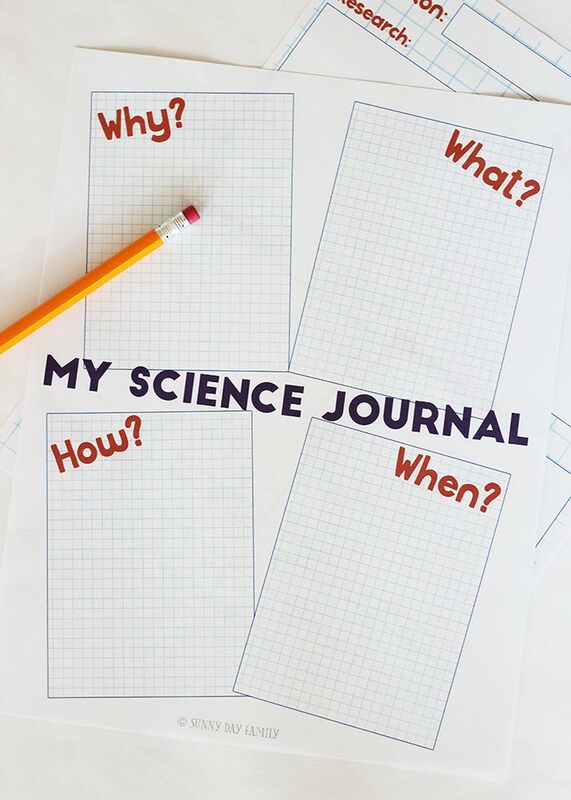 That's why I've put together this free printable science journal for kids - perfect to help keep track of all of their questions and show them how to figure out the answers too. When a copy of Ada Twist, Scientist arrived in my mailbox for review, I was intrigued. I loved the idea of a female scientist as a heroine, and loved that the book was inspired by real life women of science like Ada Lovelace and Marie Curie. (For more on Ada Lovelace, be sure to check out Ada's Ideas: The Story of Ada Lovelace, the World's First Computer Programmer, a gorgeous new biography for kids). 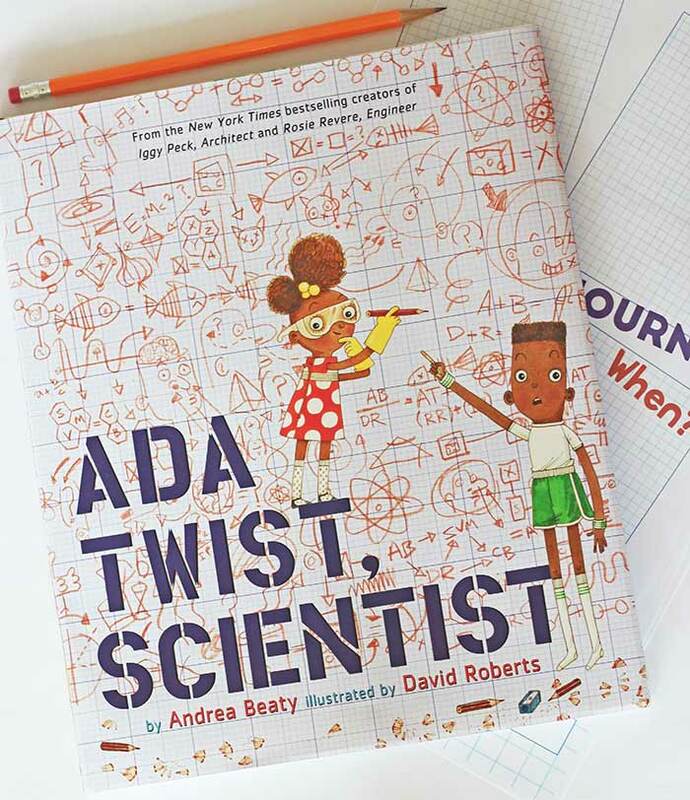 Ada Twist is a curious girl who loves to asks questions, driving her parents nuts with her constant "Why? What? How? and When?" I could definitely relate with two preschoolers on my hands who love to ask questions too. Ada's parents finally decide to encourage her to find the answers to her questions and embrace the nature of their young scientist. I want to do the same for my kids (and yours!) so I'm encouraging them to ask questions and helping them to discover the answers. 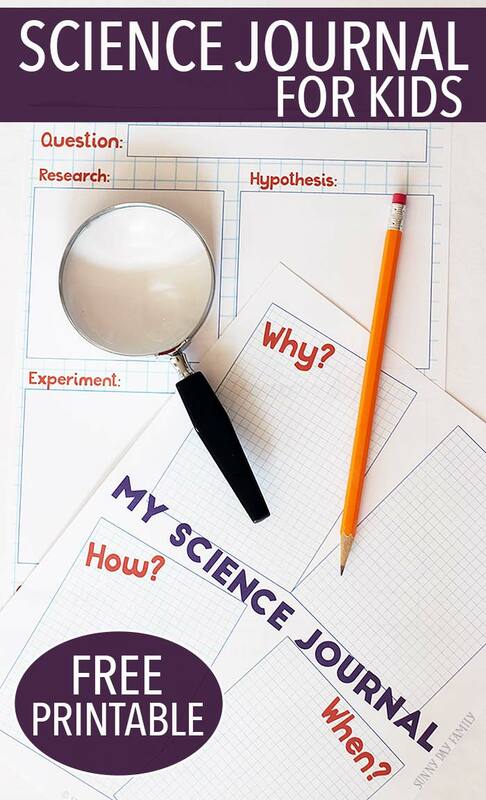 To do this, I've put together a printable science journal that will not only keep track of all those questions but will also introduce the scientific method and encourage young scientists to find the answers. This journal has two pages - the first is inspired by Ada Twist's favorite questions. This page can be used as a cover sheet, and also to keep track of all the questions your budding scientist would like to answer. Each square has one of Ada's favorite questions on it, and you can use the boxes to add in the questions you would like to answer. "Why is the sky blue?" "How do birds fly?" There is no limit but your imagination. 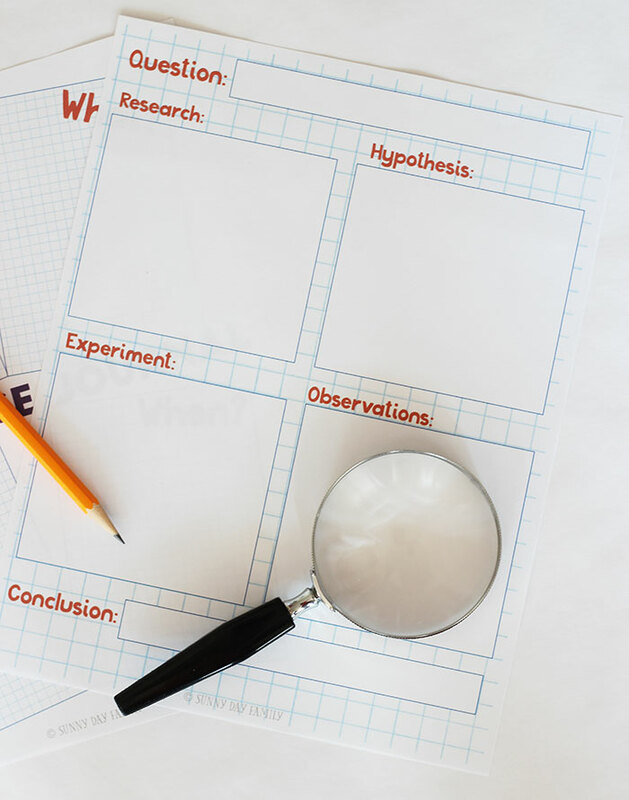 The second page is based on a simple version of the scientific method, and gives your scientist everything they need to find the answer to each question. There's a space to write the question they are working on, their research, hypothesis, experiment steps, observations, and finally their conclusion. You can print as many pages as you need to encourage them to experiment over and over again! This also makes a great planner for a science project too. You can get both pages as a free printable below - just click the button below to download yours. Now that you have your science journal, use it to try a fun experiment from Playground Parkbench - Why Do Leaves Change Color? Or check out even more great Science Books for Preschoolers from Growing Book by Book. What a great resource. I will be using it this year while we homeschool. I cannot find the "get it now" button to download the two science journal pages.